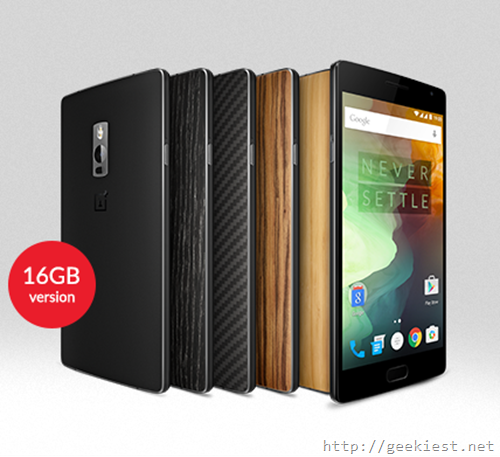 OnePlus India have announced a new version of the latest flagship killer OnePlus 2. The new version will have just 16GB of storage while the previous version was a 64GB one. The new version will be priced INR 22,999, which is just INR 2000 less than the 64Gb version. The other differences are 64GB version will have 4GB LPDDR4 RAM while the 16Gb version will have only 3GB LPDDR4 RAM. For paying INR 2000 additional you will get 48GB of storage space and 1GB of RAM. But if your budget does not allow that you can go with this 16Gb version. The wait for OnePlus 5 is over, according to a new tweet from the company.